I'll never forget the time that my toddler was sitting on the couch reading a paper book with me. As she went to turn the page, she tried swiping the page with one determined finger. She paused, confused as to why the paper page wasn't reacting like the pages she was used to on our family tablet. Watching my toddler try to "swipe" a page from an actual book, I have to admit that I felt a major twinge of parental guilt. What kind of world do we live in? Should I feel awful that my toddler was more used to electronics than an actual paper book? Well, yes and no. A 2017 study says that when it comes to helping promote reading in toddlers, e-books can get the job done too. And in fact, e-books may be an even better choice for toddlers to help them learn. The study focused on looking at how toddlers learn from ebooks as compared to physical books. The researchers wanted to specifically look at any links between behavior and vocabulary with ebooks or print books. They studied 102 toddlers between the ages of 17 and 26 months and asked their parents to read to their toddlers to complete the study. The parents were given two print books and two ebooks that had the same content to read to their toddlers. Knowing that reading print books together enhances literacy by encouraging the parent or caregiver to talk about what they are reading together, explain words and pictures, and interact, the researchers wanted to see if e-books would interrupt that connection or enhance it. But surprisingly, the study revealed that the toddlers who read the e-books actually interacted more than the toddlers with the print books. Overall, toddlers who read the ebooks had longer attention spans, were more available and ready for story time, participated more during the reading time, and commented and talked more about the content than they did for the print versions. What the results of this study suggest is that toddlers may respond better to ebook format. This could be the case because the format of ebooks for toddlers is structured so there is only a sentence or two on each page, letting them focus and fully absorb that message, instead of getting lost in a longer narrative. That doesn't mean that you should write off print books forever, but only that there may be some benefits for reading e-books with your toddler. The study may have been prompted by the fact that, like our family, e-readers and tablets are now a part of everyday life now. Instead of wringing our hands and wishing them away, we can look at them with a critical eye and carefully weigh their benefits and potential drawbacks. E-readers aren't going away anytime soon, so if there are any benefits that can be gained from utilizing e-books to engage toddlers more fully, it's important to recognize them. Reading is an important skill for all young children, and it's especially important for parents and caregivers to spend time reading with their children. Reading together has been associated with language development and literacy skills. However, until we know more about the long-term and full effects of tablets and screens on developing toddler brains, it's best to focus on reading physical books (you know, with paper pages you actually turn, not swipe) as your primary reader. The goal is to teach children to learn to love reading, and there is concern among doctors that e-books may be interpreted more as "games" than print books. Keeping the results of this study in mind, it is best to mix both print and e-books, without worry that occasional e-book is causing developmental harm. Studies support the fact that e-books can be a useful tool to helping toddlers learn vocabulary, keeping their attention, and making reading a fun and desirable activity. 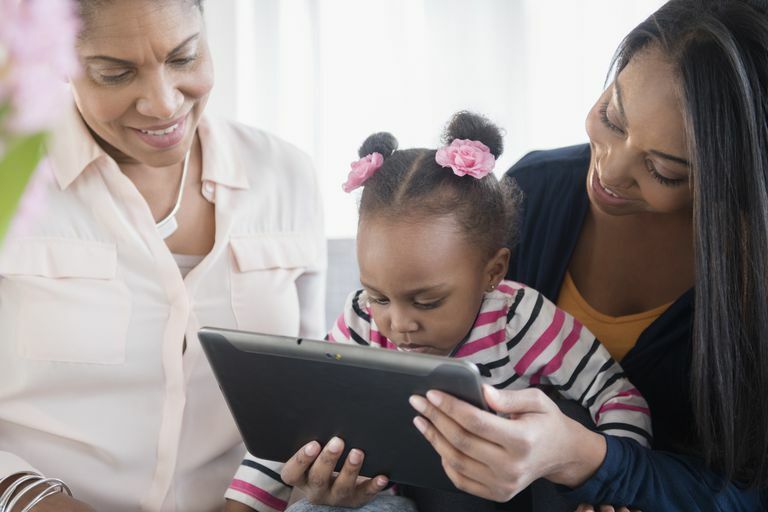 Doctors and education leaders are still completing ongoing research about just how effective e-books are for children of all ages, and especially toddlers. Feel free to mix tablets or other ebooks into your reading routine with your toddler and above all, remember to keep reading fun.